Classically trained cellist Beth Robinson has been teaching cello to students ages 4-adult for nearly 30 years. Based in Potsdam, NY, she began playing for dances in the late 1980’s at a time when there were few cellists to guide her and so she looked to other instrumentalists for inspiration. Her mentors and teachers include fiddlers David Kaynor, George Wilson, Claude Methe, pianist Jacqueline Schwab, and guitarists Dana Whittle and Paul Marchand. Over the years Beth has been a founding member of contra dance band, “Frog Bridge”, tango band, “Piquant”, and currently “Caramelo”, a latin rhythm based ensemble. 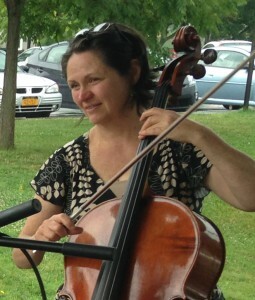 In addition to cello, Beth is a Certified Alexander Technique Teacher. She currently teaches at SUNY Potsdam, and works predominantly with musicians. Musicians perform complex and demanding physical movements and the Alexander Technique helps them improve the quality and ease of their actions, and in so doing, helps improve the quality of the music itself.